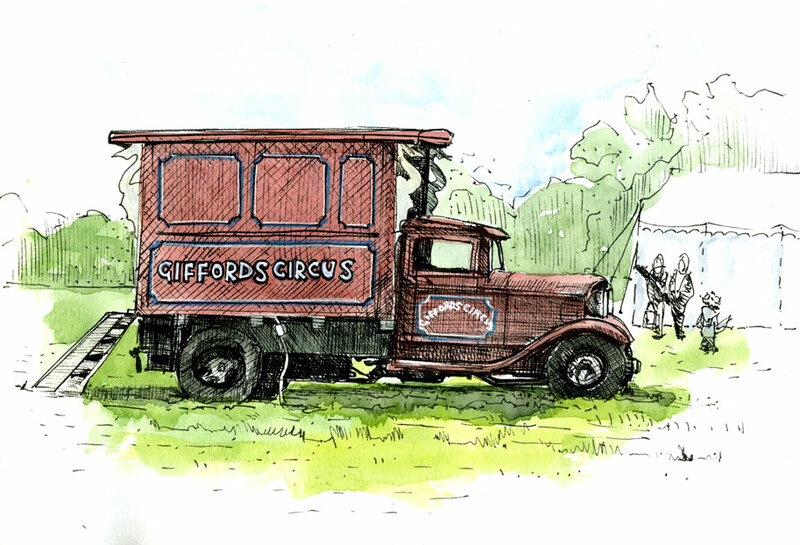 It’s that time of year, late summer when we think we have run out of time to see them but manage to get our acts together and get tickets at the last minute… for GIFFORDS CIRCUS ‘Raaaaayyy!!! I arrived early so that I could draw one of the vintage vans that Giffords travel in around the Cotswolds and the South West. If the weather is fine, it’s nice to arrive early and have a picnic and then you are sure to get good seats in the main tent. 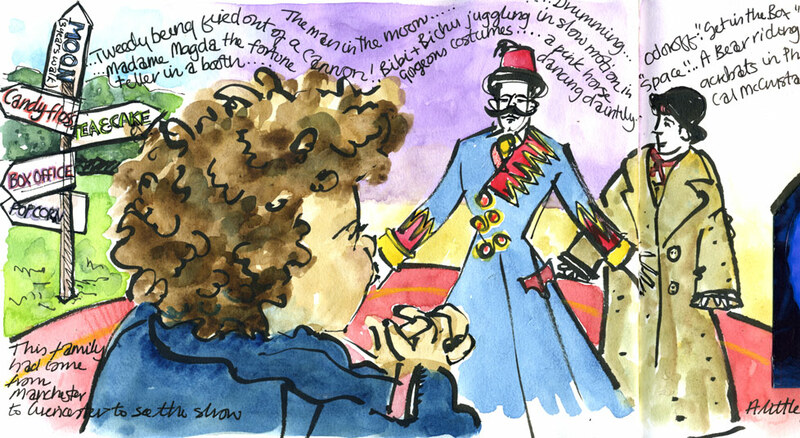 I managed to do a quick drawing with my brush pen of the circus ring whilst Tweedy the clown warmed us up chatting and giving all the children high fives whilst taking his pet iron Keef for a walk, but I was soon totally absorbed in the show- mesmerised. I only managed to take a couple of photographs because I kept forgetting – too busy laughing my head off or gasping in wonder. 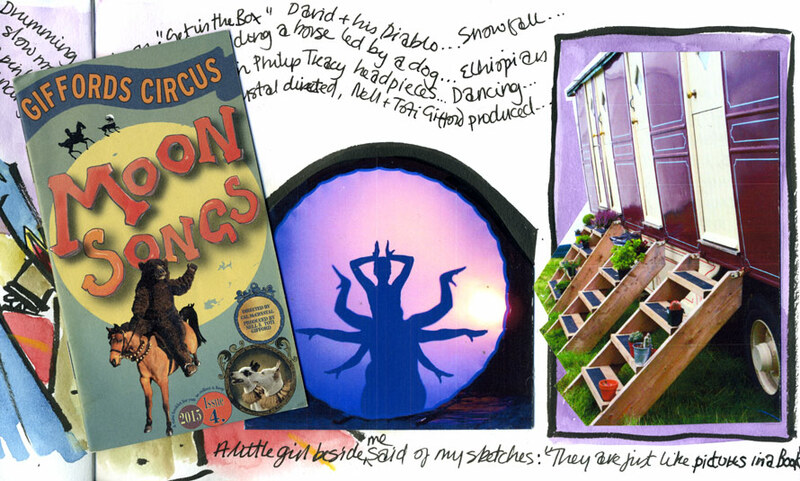 I love everything about this Circus. The live band play each show as if they are jamming together for the pure pleasure of it. Tweedy is one of the most charismatic performers I have ever seen, his grasp of physical comedy is brilliant, his timing perfect and his rapport with the audience perfectly pitched. 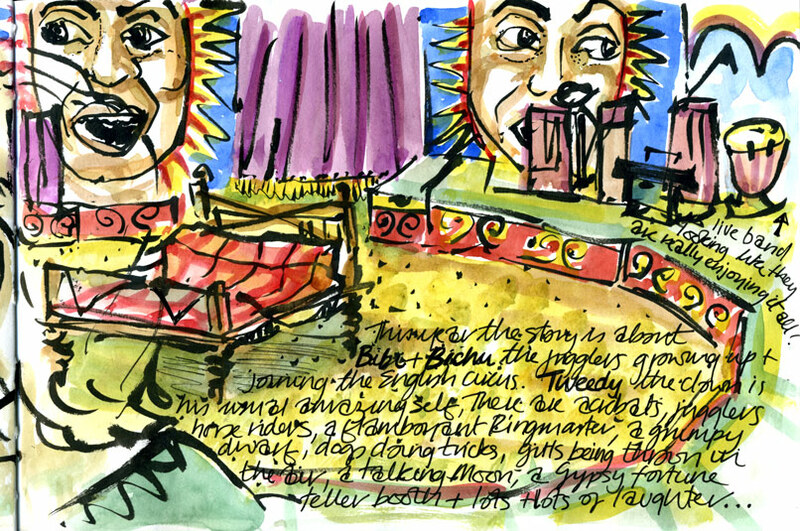 The jugglers Bibi and Bichu are handsome, skillful and endlessly inventive. All the other performers – from the raffish ringmaster to the athletic acrobats manage to look like they are having the best time of their lives and the most fun together – an amazing feat considering that they have been doing up to three shows a day since May. I collect the mini programme booklet each year and save it in a pocket in my journal (made from the photo of the dancers in the moon). 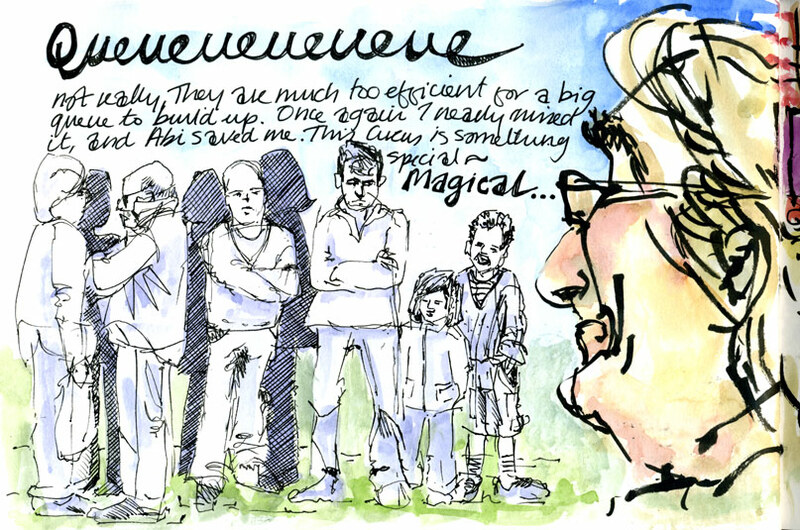 I’m not sure if you can read my writing so I will just point out (ahem) that a little girl who sat beside me watching me draw said in awe of my sketches ” They look just like pictures in a book” and I was thrilled by her praise. This was my favourite part of the show … Only joking!! My favourite part of the show was Tweedy being SHOT OUT OF A CANNON!!! Alison, I can feel your “Raaaaayyy!! !” in all the drawings! It really is the most joyous experience! I am like a little child again, no filters, just amazement. What a wonderful blog! And the heck with the acts. I’d be overjoyed just to get to see those wonderful old traveling vans and caravans! !